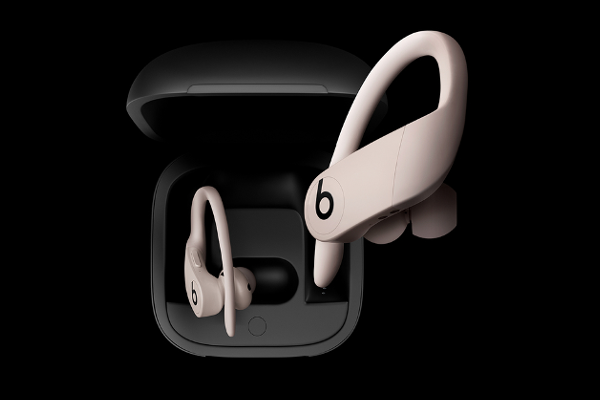 Beats unveils Powerbeats Pro wireless earphones with Apple's H1 chip and "Hey Siri" support. Apple-owned Beats by Dr. Dre (Beats) today introduces Powerbeats Pro, completely wireless earphones that deliver powerful sound. Powerbeats Pro features industry-leading battery life, exceptional fit via the signature earhook design and reliable connectivity. To achieve the best possible fit on the widest array of ears, over 20 configurations were electronically modeled and physically tested. The result is a completely new, ergonomically angled acoustic housing that nests comfortably in the concha bowl of the ear with an off-axis nozzle. It comes with four sizes of ear tips and a redesigned, adjustable earhook-an iconic part of the Powerbeats line since its launch in 2010. Powerbeats Pro is 23 percent smaller than its predecessor and 17 percent lighter. The lightweight design is also sweat- and water-resistant. Each earbud has up to 9 hours of listening time and more than 24 hours of combined playback with the magnetic closure case. With Fast Fuel, you get 1.5 hours of playback after just 5 minutes of charging and up to 4.5 hours after 15 minutes of charging. Class 1 Bluetooth technology offers extended range and exceptional cross-body performance, meaning fewer dropouts. Each earbud independently connects to your device, so you can choose to use one or both. Setup made easy. Pairing is done via the Powerbeats Pro case-simply opening the lid for the first time prompts pairing mode. Powerbeats Pro is automatically paired with any of your supported devices that are signed in to your iCloud account. Powerbeats Pro is compatible with both iOS and Android devices. Simply say "Hey Siri" for voice-activated assistance without having to reach for your iPhone. Powered by the new Apple H1 chip, Powerbeats Pro delivers a faster and more stable wireless connection to your devices.